With Bo Space, the architecture and design firm WJ Design by Leo Hu has crafted a mixed-use commercial space in an old industrial facility, with the aim of creating a warm, relaxing ambience. With Bo Space, the architecture and design firm WJ Design by Leo Hu has crafted a mixed-use commercial space in an old industrial facility, with the aim of creating a warm, relaxing ambience. Breaking right away from a hi-tech style, Bo Space instead focuses on the beauty of a repertoire that mixes tradition with the latest interior design trends. Recovering old buildings instead of tearing them down to make way for new architectural volumes is a positive - and intrinsically sustainable - trend that is growing and making its way across the world. And many designers in China have taken up the trend too, with very interesting results. One of these designers is Leo Hu, who burst onto the international scene after just a few years in operation, with his studio, WJ Design founded in 2014 already winning lots of awards. Starting from the premise that in present-day diversified architectural design, modern buildings are often aggressive and don't preserve or create an initial aesthetic sensation. In other words, they don't have that touch of magic that assures that the construction in question will be recognised in the future and stored in our collective memory. Leaning on Mies van der Rohe's much-abused assertion that “less is more” in an oriental vein, Leo Hu seeks the truth of the architectural object with a less artificial design as we can see in his Bo Space project in Hangzhou. Bo Space is a mixed-use commercial space that includes a restaurant and bar (Chin-Chin), exhibition space, flower shop, and fashion design studio. 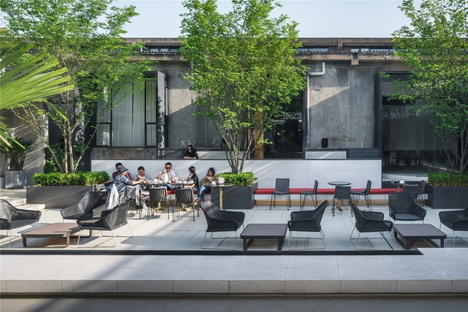 It is located in HE Park, an old, disused industrial site in the Xixi Wetlands, Hangzhou, now redeveloped into a meeting place for culture and innovation. The city of Hangzhou, south of Shanghai has a population of about 10 million and is expanding so rapidly that it risks losing its cultural identity, according to Leo Hu. So the designer opted to keep alive an old building through a transformation that led to the creation of a complex area: Bo Space aims to communicate a way of life. The venue's diversified offer means people can discover what they really like, even if it's just a ray of sunshine, a photography show, a great meal, a slower pace. 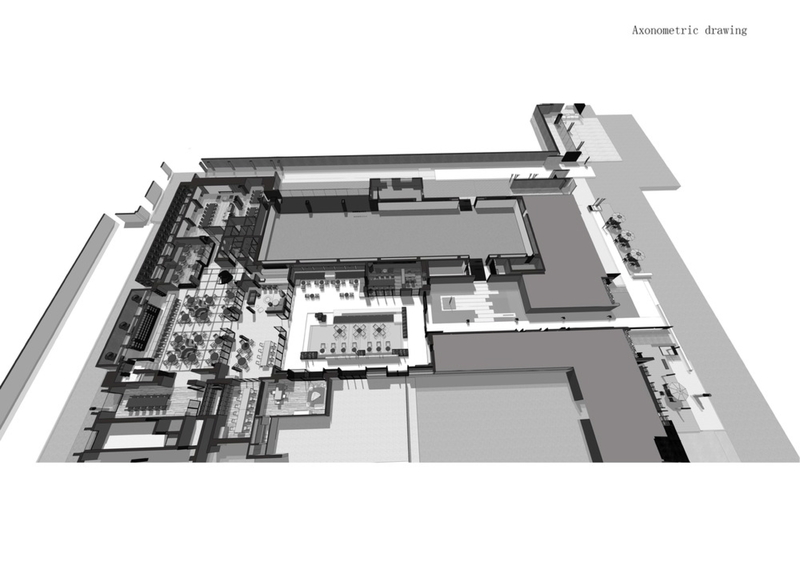 So, WJ Design has retained the imprint of the old factory building and has created a new space behind the long corridor. The area's original sunken area has been turned into a small outdoor courtyard where people can enjoy a break in fine weather. The interior design project involved tearing down the walls opening onto the sunken courtyard and replacing them with glazed openings to widen the views to the outside. An atrium was added indoors to further lighten the old and underscore the connection between interiors and exteriors. The large restaurant and bar are located on the ground floor and a black spiral staircase takes you up to the first floor, where some fashion designers have their boutiques. Here, a large empty space could be used for future art exhibitions and fashion shows. The terrace will be a great space to use in summer. Leo Hu's project for Bo Space gives a reinterpretation of the old industrial building that goes beyond the post-industrial appeal that is all the rage at the moment to also embrace its performance over time.